Perhaps I wrote too soon last week with my grand announcement that I was back – as I have been remarkably absent ever since! Nothing drastic – just life getting in the way of my aspirations to create and write. However I seem to have achieved enough in my non-crafting life to allow me to return to some creativity again, so do have some achievements to report! The life that got in the way? My mum went home (after an amazing effort and gift of her time to both me and my children) and the reality of parenting meant birthday parties to deliver children to, groceries to buy, a house to clean and tidy and the ever present Mount Washmore to climb and attempt to defeat (if you can defeat a mountain.) Luckily I also had time to catch up with friends and had several drop in for a cup of tea or glass of wine on Sunday afternoon in rolling succession – a lovely reason to not be crafting! Then the school week began and with it the new arrangements for childcare. On the whole they seem to be working well, although I am finding that I don’t have enough time at work to feel that I am on top of my job….. so some tinkering with the plan might be in order when school resumes in two weeks. I spent a lot of time at school at the beginning of the week to address issues with the boy, but then he got in the groove and had a good week. In the meantime discussions with therapists, reports from teachers and a low level feeling of despair about the whole situation meant that crafting wasn’t happening. But then last night I remembered the therapeutic benefits of crafting and hey presto – I got out some fabric, the ruler and a plan and away we went! I am feeling much better and I am back to planning my next project! The timing to get my sewing groove back on is brilliant – the children are going away to visit their father tomorrow, for almost two weeks, and while I will miss them, it means that I have lots of time to do things for me without interruption! I may even make dinner plans with some friends. Just the thought of uninterrupted sleep is enough to make me giddy with excitement! So what did I make? The first part of a set that I am making for a lovely friend and colleague who is a pug breeder and general dog lover. She asked me to make her an ipad over and a bag for her keys and phone for when she is at dog shows. I pointed her to the Spoonflower website and she found some fabric made by a friend’s daughter that depicts two pugs – one that my friend bred and one that she used to own! So that made her choice easy! Last night I made the ipad cover and am happy with it. 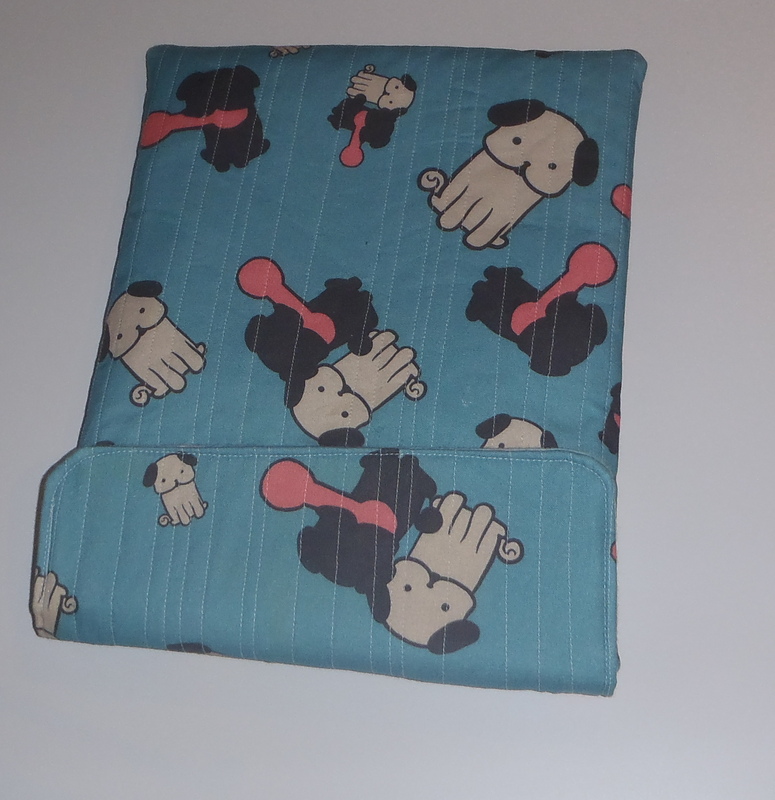 I padded it with bamboo batting and fusible fleece and lined it with flannel so it is super soft for the screen. 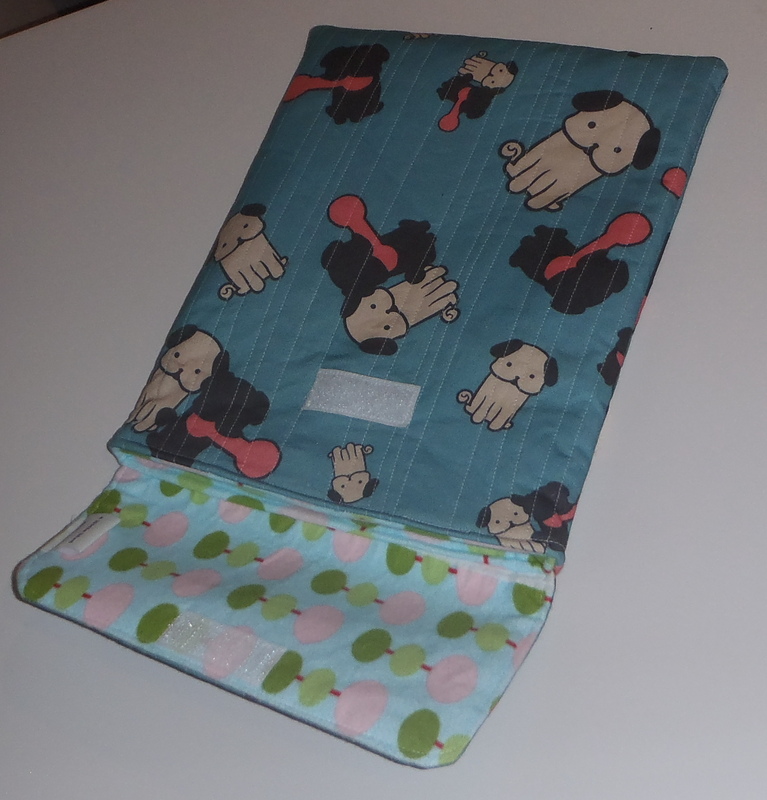 Next on the list is the pouch for her keys and phone for dog shows – she wants to be able to hang it of her shade shelter so I am working on a wrist strap with Velcro concept….. to be completed on the weekend! 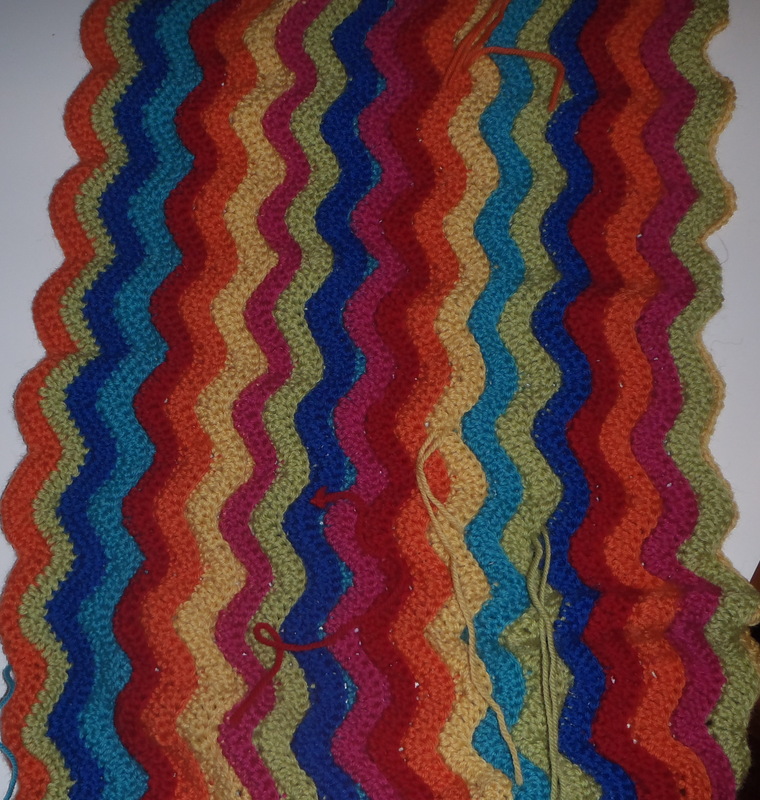 I thought I would also share a photo of the progress on the afghan I am crocheting. I tend to work on it while at the children’s martial arts class or when watching TV – but as I rarely watch TV it is mainly at classes. I haven’t been weaving in the ends yet, but am happy with the random colour scheme! So, without any big announcements about being back, I am quietly hopeful that I will have more creative endeavours to share with you over the next couple of weeks. In the meantime I hope that you have all been well! This entry was posted in Uncategorized and tagged afghan, crochet, ipad cover, life, pug, Sewing on April 11, 2013 by a little bird made me. They look fantastic! Glad you’re back at it. By the way, I don’t know if I ever let you know that the red bag was beautiful. Just the ticket! I am so glad Louise! Thanks for letting me know.